You’ve purchased a brand new house — new construction — that came with a builder-grade patio. You’ve purchased an older home where the prior homeowner kept the original builder-grade patio. You’ve been living in your home for a while now, and you have it set up pretty much like you want it, except for the builder-grade patio. You’re probably picking up on our theme here. 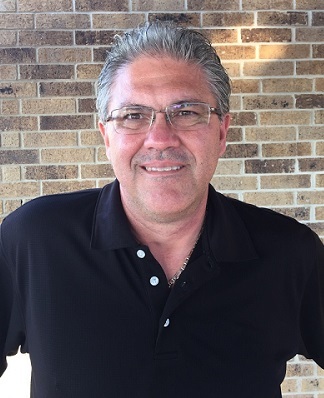 If one of the above signs describes your situation, then you have a lot in common with our recent clients, who needed a reputable Round Rock patio builder. Wisely, they called Archadeck of Austin for a free design consultation. We have built many, many patios over the years, and each new client benefits from those years of experience. Today’s featured outdoor living project is a patio extension, but it’s really more than just an increase in the patio’s size. When you increase the size of a patio (or a deck, for that matter) you increase its function exponentially. Suddenly you have a more livable outdoor living space that you can actually do something with. Decorate! Entertain! Cook out, eat out and just sit around relaxing with family and friends. These homeowners wanted to increase their patio’s livability even more. Their dream project included a fire pit and an outdoor kitchen. At one point they were considering a deck addition instead of a bigger patio. As they explored options with their Archadeck designer, however, it became clear that extending the patio would be less expensive than adding a deck. And a patio would be the ideal setting for a fire pit and outdoor kitchen. That settled it. When Archadeck of Austin builds patios, we dig trenches. Seeing the finished project, you wouldn’t know we’ve done that, but we add these trenches to give homeowners some extra peace of mind. We use a beam system under all of our concrete patios. First, we dig trenches about 12″ deep along the perimeter and some within the interior of the patio area. The perimeter and internal beams are reinforced with steel rebar to stabilize the patio. Having this reinforced beam system within the base of the concrete structure prevents the patio from moving and settling over time. While it’s still possible that the concrete will crack, as it often does, having that extra stability means ground movement will not cause structural damage to the patio. We also dug a trench to run conduit for gas lines that would be needed for the fire pit and the outdoor kitchen. The trench specifically for this purpose must be 18″ deep. 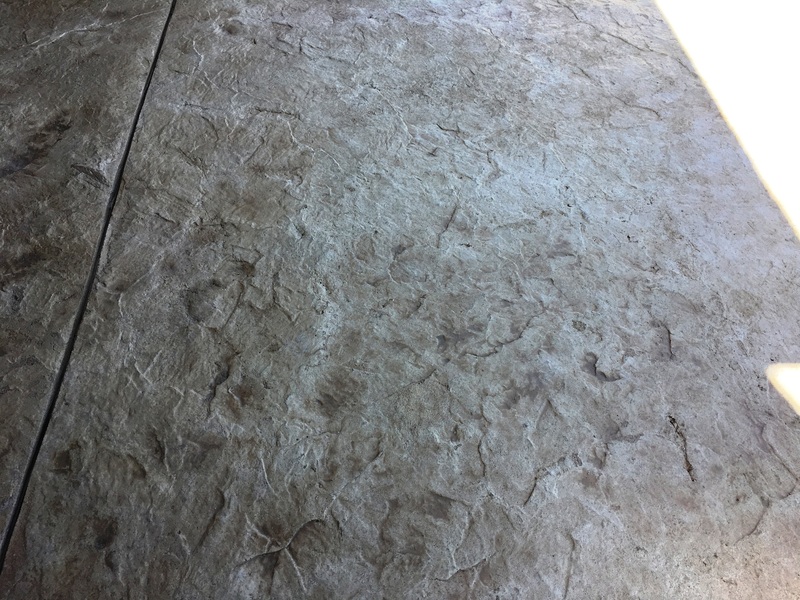 For this patio, we used an overlayment process to create the beautifully textured surface you see here. Once the trenches are dug and steel are in place, then we can pour concrete. For this patio, we used an overlayment process to create the beautifully textured surface you see here. We also added two sets of stairs, one by the kitchen leading to the side yard and the pictured stairs running to the rear yard. We also added two gates to the top of each , as they have grandchildren and pets to contain. 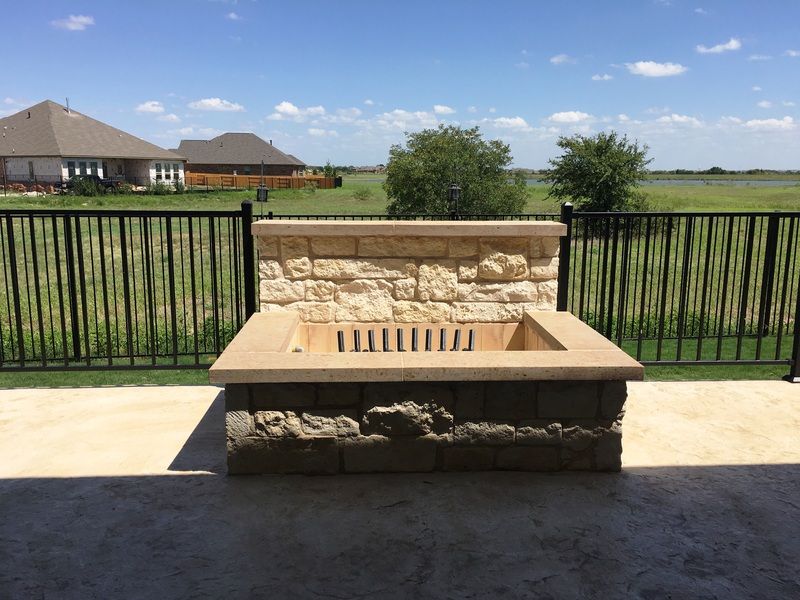 Now we come to this project’s special added features, which are very popular in Round Rock: the fire pit and the outdoor kitchen. These structures are made of white limestone. The outdoor kitchen includes a gas grill and a pedestal for the homeowners’ Big Green Egg style smoker. The 4′ fire pit has a regulator and starter. Notice how the back wall of the fire pit is built up so we didn’t need to run any railing across the backside of the fire pit. While practical, the stone wall also adds character to the project. The finishing touch for this patio is a black metal railing system, by Fortress, that borders the patio’s edge. The railing helps define the area visually while also providing safety. As you can see from the before and after pictures, these homeowners gained more than just a bigger space when they extended their builder-grade patio. They gained a multi-functional outdoor living area, with an emphasis on living. 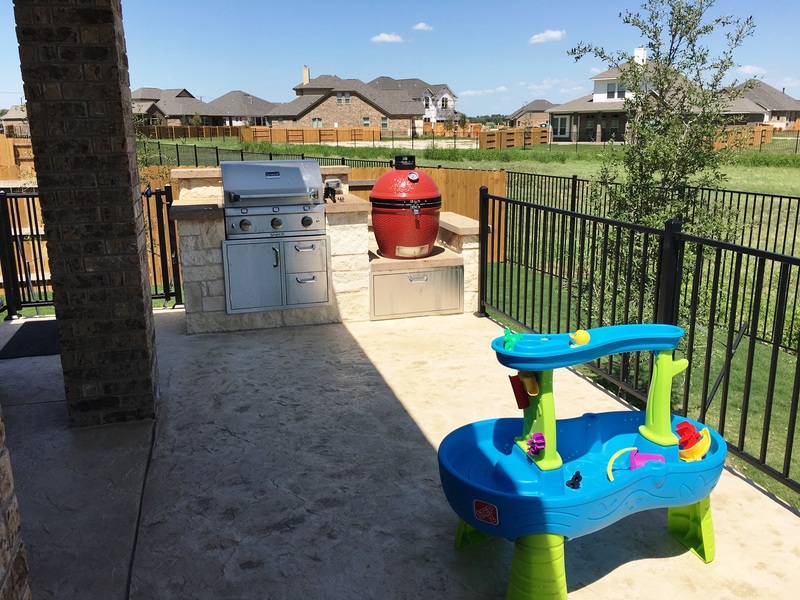 These clients are so pleased with the finished project that they have already referred Archadeck of Austin to two neighbors looking for a Round Rock patio builder specializing in outdoor kitchens and custom outdoor fire features. We love referrals! 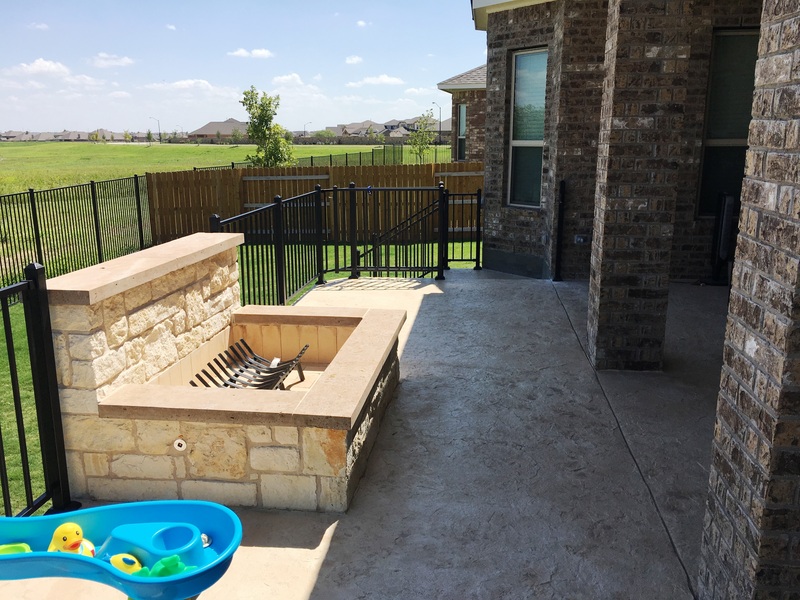 If you have a builder-grade patio and want to learn more about the many benefits of expanding it into a more livable outdoor living space, contact Archadeck of Austin today at (512) 259-8282 or via email at jim.odom@archadeck.net to schedule a free design consultation. This entry was posted on January 19, 2018 by austinporchandpatio. It was filed under Archadeck of Austin, Austin fire pits, Austin outdoor kitchen, Patios, Patios and Hardscapes and was tagged with Archadeck of Austin, Austin outdoor kitchen, Austin patio builder, outdoor fire pit, Round Rock Fire Pit Builder, Round Rock Patio Builder, Round Rock TX outdoor kitchens, Taking your Round Rock Backyard Beyond Builder Grade.